Who doesn't love eating out? We Filipinos are known to love food but the question of “Where should we eat?” is one of life’s happiest struggles. The restaurant and cuisine options nowadays are endless. Now, if only your budget was as vast as the choices that you have. Worry no more -- Eatigo has your back! Eatigo may be new but it has fast become one of the leading restaurant reservation platforms in the Metro. Founded in 2013, Eatigo’s mission is to connect empty tables with empty stomachs by offering time-based discounts of up to 50% every day at all of its participating restaurants through its online website and mobile applications. With Eatigo, you get to choose where to eat without having to worry about your budget because it offers up to 50% discounts on every restaurant partner. 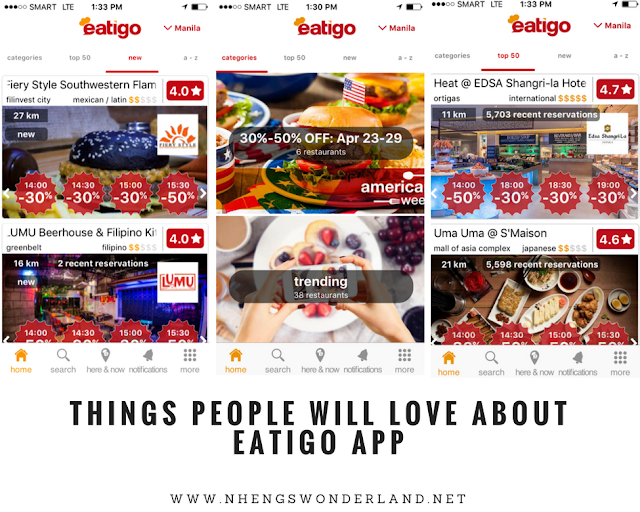 Here are some of the things people will love about Eatigo App. When stumped for ideas on where to eat for lunch, a quick meeting, a dinner date, or a family get-together, Eatigo is your friend. These diverse dining concepts join its already impressive listing that includes Heat at Edsa Shangri-La Manila, Alta at Ascott BGC, Ramen Nagi, Vengo, Gelatofix, and many others. They have atleast 500 partners within Metro Manila. Discounts for almost 50% OFF! Look forward to the days and weeks from Eatigo with a lot of discounts! Besides having the regular calendar of discounts on the app, Eatigo makes sure to excite customers by cooking up special campaigns. Start your May with Eatigo’s WOW Wednesday -- Starting this summer, Eatigo offers 50% discounts all day at your favorite restaurants on one Wednesday of each month. This May, WOW Wednesday is scheduled to happen on May 9. Keep your eyes peeled for promos on the dedicated WOW Wednesday panel on the Eatigo app. Eatigo will reward its member's incentives or corresponding points for their continuous support so you better watch out for it! Having seated over 5 million diners at more than 2,000 venues across the region, eatigo is the leading online reservations platform for restaurants in Asia, downloaded by more than 1.5 million users. Backed by Tripadvisor, Eatigo is available in Hong Kong, Singapore, Thailand, Malaysia, India & the Philippines, and is expanding to more countries. Users can choose to dine anywhere, from upscale hotels to popular food chains, and enjoy the same discounts with no strings attached, while restaurants get to fill their empty seats during off-peak hours. The best part? It’s completely free to use. Participating brands for the various promos will be revealed on the official Eatigo Facebook page, so like it now. Eating out has never been this fun and affordable! So make every day, an Eatigo dining day! Download the app now and get amazing discounts!